Tokyo (VNA) – Politburo member Pham Minh Chinh met Chairman of the House of Councillors of Japan Date Chuichi and Japanese Foreign Minister Taro Kono in Tokyo on August 30, the last day of his working visit to Japan. Chinh, who is also Head of the Party Central Committee’s Organisation Commission and Chairman of the Vietnam – Japan Friendship Parliamentarians’ Group, said Vietnam will continue pushing forward administrative reform and improving business climate to create favourable conditions for foreign investors in Vietnam, including those from Japan. He asked Japan to continue providing Vietnam with official development assistance (ODA) in the near future. Date Chuichi said the Japanese House of Councillors will continue to support bilateral ties and increase exchanges between the two countries’ parliamentarians and people to further bolster trust and mutual understanding between the two nations. Taro Kono, for his part, expressed wish to further develop the bilateral extensive strategic partnership. He committed to working closely with Vietnam in regional and global issues to maintain peace, stability and development in the region and the world. 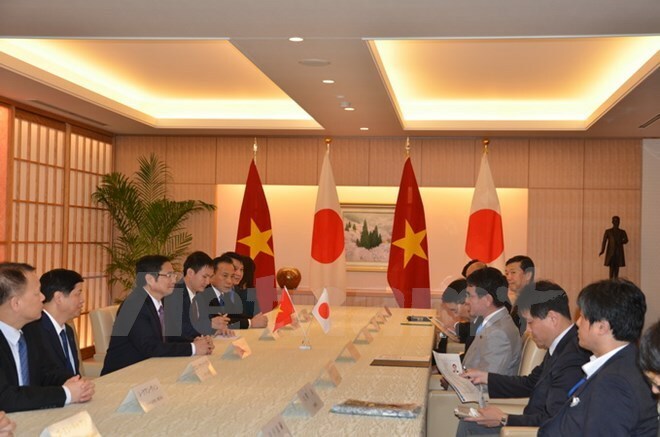 The Japanese side vowed to assist Vietnam in projects regarding infrastructure, administrative reform and high-quality workforce training funded by Japanese ODA. They underscored Japan’s full support for Vietnam to fulfill its role as host of the Asia-Pacific Economic Cooperation (APEC) Summit 2017. The two sides promised to effectively work together to celebrate the 45th anniversary of bilateral diplomatic ties in 2018.